While lawn tractors really can make great snow blowers and plow pushers, they do require some modification. One important modification that shouldn’t be overlooked is the addition of tire chains. On a lawn or driveway, a garden tractor usually has enough traction in the tires, but on snow and ice, it’s a different story. Tire chains add extra traction to the tires to dig into the slippery stuff and keep you going. Do Chains Come in Different Sizes? Tire chains are not universal, so it’s important to know what size tires you have. To determine the size of your tractor tire, you need to take a look at the side of the tire. 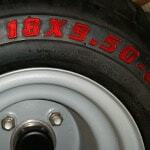 There are raised numbers on the side that indicate the tire's diameter and width. Clean the tire off if necessary to get a better view. 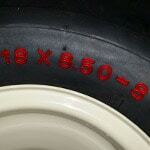 On the sidewall of your tractor tire, you’ll find a series of numbers. There may be two numbers or three numbers. The numbers represent mostly the same measurements. The only difference is that the second format features tire height. Don't worry about the slashes and dashes - they just separate the numbers. No division or subtraction is required here. If the tire lists two numbers, such as 6.5-16, the first number will be the width and the second number will be the diameter of the rim. In this case, the tire is 6.5” wide with a 16” diameter for the rim. If the tire lists three numbers, such as 26/12-12, the first number is the height, the second number is the width, and the third number is the rim diameter. So in this case, the tire is 26” high, 12” wide, and has a 12” diameter rim. When shopping for tire chains, look for the chains' list of tire sizes they’re compatible with. Each item's page should list this information. If you're shopping in-store, check the item's packaging for similar compatibility information. There are various manufacturers of tire chains, but most of them should fit various brands of tires, so brand is of less concern. You should be mostly concerned with compatibility and style. Carefully check the compatibility details for the chains you’re interested in before buying and you should have nothing to worry about. 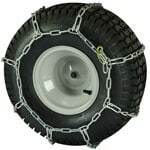 Lawn Tractor Tire Chain Sizing.. Our Power Equipment Direct how-to library can help you learn about Top-Rated & Best-Selling Three-Stage Snowblowers, Farmers Almanac Winter Weather Predictions and Proposition 65 Product Labeling.